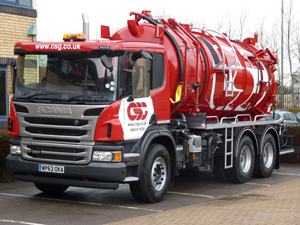 CSG is renowned for its commitment to sustainable waste management and the development of award-winning new technologies to handle increasingly complex wastes, but the company had rather more humble beginnings as a one-man business emptying domestic cesspits and septic tanks. It’s remained a core part of the CSG business for 80 years, and no other company in the UK now maintains as many off-mains drainage systems. Tens of thousands of homeowners, businesses, hotels, and catering establishments across the country now rely on CSG to keep their systems working efficiently. When the company’s founder began emptying cesspits at farms and small cottages in rural Hampshire, he could not have predicted the tasks the company would be called upon to perform decades later – or that a specialist fleet of modern CSG tankers would be criss-crossing the country to carry out this vital work. And he certainly couldn’t have imagined that the company would be operating at the best-attended event on the British sporting calendar – the British F1 Grand Prix festival at Silverstone. A record crowd of over 350,000 attended this year’s festival weekend and CSG operatives were there every day to face the challenge of ensuring the drainage systems could cope with demand! They were called upon to empty all septic tanks and cesspits at the track and spectator camp sites, taking away around 900 cubic metres of waste over a five-day period and transporting it to treatment plants. And they were back at Silverstone again to perform the same task during the British MotoGP. Silverstone isn’t the only world-renowned site at which the CSG drainage service is at work. For instance, the company also regularly turns up at the new Stonehenge Visitor Centre from where it removes sewage sludge from the drainage system and transports it for processing.